Modena, Italy, November 4, 2015 – "C’mon, man, can you figure me out as a 40-year old rapper?" France’s Earvin Ngapeth laughs as a career in music post-volleyball could await. Retirement is probably a long way off, though, for the 25-year-old 2015 World League and European Champion who has been one of the many stars at the centre of quite a remarkable season for the French men’s team. "No way. I simply like music, I will always listen to rap." The enigmatic Ngapeth is becoming quite the cult figure both on and off the court, with a confidence on court and off it that has earned him many fans, both in France and around the world. He is now back with Italian club Modena in a team that could be described as a who’s who of some of volleyball’s most impressive athletes. Brazilian setter and middle blocker Bruno Rezende and Lucas Saatkamp ("Lucas is one of the three best players in the world" says NGapeth of his new teammate) as well as Italian opposite, libero and middle Vettori, Rossini and Piano and Serbian spiker Petric are currently starring for the northern Italian outfit. So where did it all go so right for the star from the south of France? 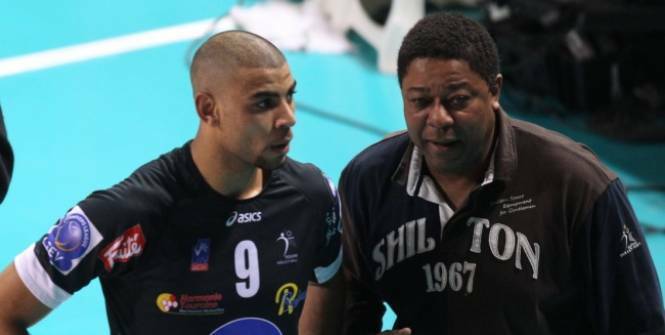 "Dad Éric" is of course Eric Ngapeth, a European Championship finalist in 1987, four years before son Earvin was born. Originally from Cameroon, he won five French titles before turning his attention to coaching. The opportunity to watch some of the best volleyball players as a child had an influence on the younger Ngapeth. But there was one in particular who caught his eye. "My idol? I’ve got many but I was a fan of Frantz Granvorka," he said. "My father was his coach in Paris, I followed his career since he came to play here in Italy. "Anyway, my dad was the person who had more influence on my career." Influence and idolization will only get you so far however, and there was a time when he wasn’t entirely focused on the sport. "There wasn’t a real spark [to start playing volleyball], but I can recall the mood I had in 2007, probably the year that changed everything," he admitted. "I played volleyball, but I was not really on it, fully minded. "The 2007 Boy’s European Championship, at that time called Prejuniores, was starting in Wien, Austria and a week ahead the tournament they asked me to join the team as replacement for an injured player. It was [Benjamin] Toniutti’s generation, they were all bigger than me. I played opposite, we won the Championship so I thought: this is my sport." A lot has happened since then and in 2015, France reached new heights. The world No.10 recorded a staggering 23 wins and just one loss to claim a maiden World League title before adding a first European Men’s Volleyball Championship a few months later. The side had previously earned medals in both tournaments, but had fallen short on all occasions. What was the difference this time? "We had second, third places in the recent past, never got first with France. So now, after the European Championship gold, we feel a great, great enthusiasm for our team at home. "This win will always stay among my best memories because we won with this group: the same guys I started playing with when we were a junior squad, and now we’re pro. "Thinking about the World League, it all started last year," Ngapeth revealed. "We got very close to get the ticket to the final, but we had that match in Australia, it was very difficult after a long travel." On that occasion France went into the Group 2 Finals with just two losses across the 2014 tournament. They met Australia in the finals, who had finished bottom of their Intercontinental Round pool. It was all setup for France to qualify before the Volleyroos delivered a hammer blow to send the French crashing out denying them a place at the Group 1 Finals. "That’s why this year we said to ourselves: It’s time to do it now," Ngapeth adds. "We beat Brazil and that helped us to play with no more pressure. "The power of France, now, is based on our 10-year experience together. This is our big secret. Three years ago our coach Laurent Tillie planned it: everyone else out, let’s start again with this younger group. He was confident on our generation. "After 10 years together and three years of hard work, we got the results. Hard work paid back." The volleyball season stops for no one, however, and focus has already turned to the Rio 2016 Olympic Games. France find themselves in the unenviable position of having to compete with world champions Poland, London 2012 Olympic champions Russia, European Games winners Germany, World League 2015 runners-up Serbia as well as Belgium, Bulgaria and Finland for ticket to Rio. It is arguably the toughest route to the Games, but for Ngapeth, it is just one more set of matches. "We are a steady group, we feel quite well so there is no need for a change," he believes. "Moreover, there is not much time to stay together ahead the Olympic qualification tournament." For all the talk of France’s recent resurrection, they still know how to have fun. Their numerous gimmicks during pre-match photos are shared thousands of times online, with French comedian and prankster Remi Gaillard famously involving himself on one occasion during the season. "It started with me, [Julien] Lyneel and all the other guys," he explained. "Maybe we have not the strongest players on board, maybe we’re not the tallest, but we go anyway: that’s the spirit of the fan page we created for our team." And as for alter-ego Klima and rapping? 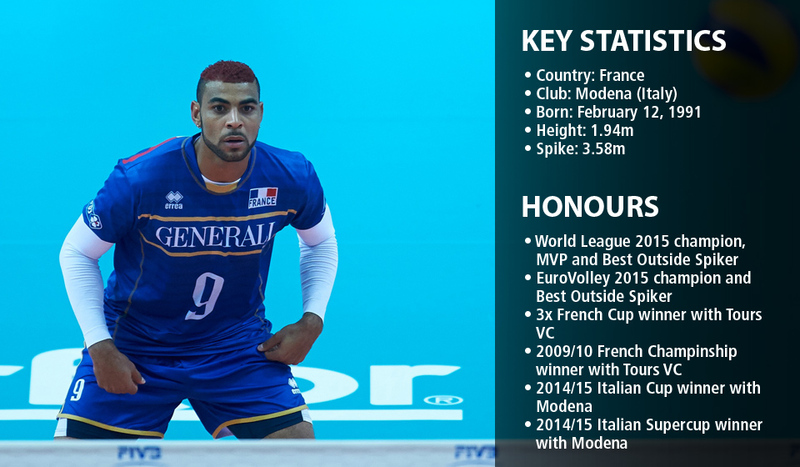 "The rap stuff all started before volleyball, when I was playing football," Ngapeth beamed. "I went together with friends to a rap concert, there was an ‘open mike’ session after that. We started there, then we went on making the music we liked. "Will I do it after volleyball? No way. I simply like music, I will always listen to rap. My favourite is Rohff, a French rapper." 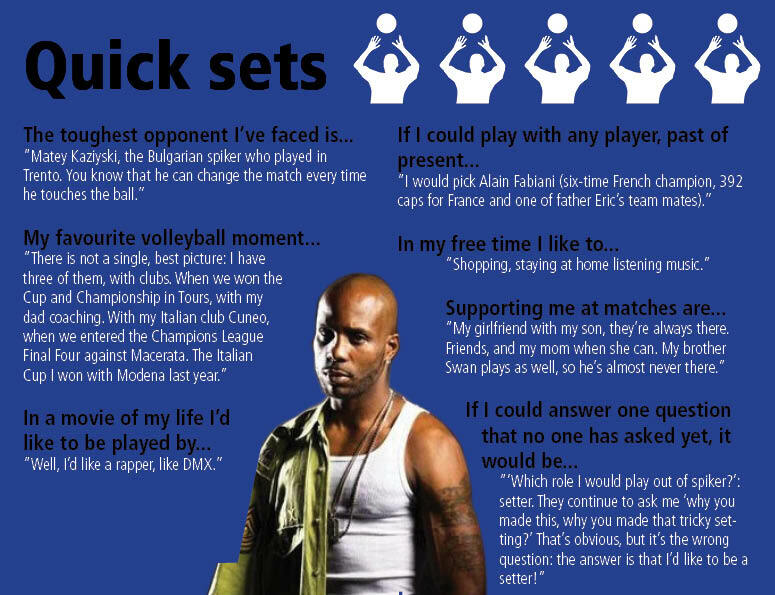 Hopefully for fans the after volleyball plans are far from Ngapeth's thoughts.